IL-31 South to US-14. Left onto US 14/Northwest Hwy (2.9 miles) to 1st Street. Turn left onto 1st Street. Right onto Sunset Drive and follow around and left onto Crest Drive. 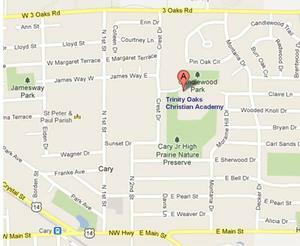 Turn right onto Trinity Oaks Way. End at 233 Trinity Oaks Way. IL-22 West to US-14. Right onto US 14/Northwest Hwy (1.8 miles) to 1st Street. Turn right onto 1st Street. Right onto Sunset Drive and follow around and left onto Crest Drive. Turn right onto Trinity Oaks Way. End at 233 Trinity Oaks Way. IL-31 North of Algonquin Road to Cary/Algonquin Rd. Right on Cary/Algonquin Rd. to right on US-14/Northwest Hwy (3.3 miles). Turn left onto 1st Street. Right onto Sunset Drive and follow around and left onto Crest Drive. Turn right onto Trinity Oaks Way. End at 233 Trinity Oaks Way. US-47 South to US-14. Right onto US 14/Northwest Hwy (12.6 miles) to 1st Street. Turn left onto 1st Street. Right onto Sunset Drive and follow around and left onto Crest Drive. Turn right onto Trinity Oaks Way. End at 233 Trinity Oaks Way.